Danny Lee had an encounter with an alligator while playing a game. New Zealand golfer Danny Lee had a close shave with an alligator while playing a round of golf on Thursday. 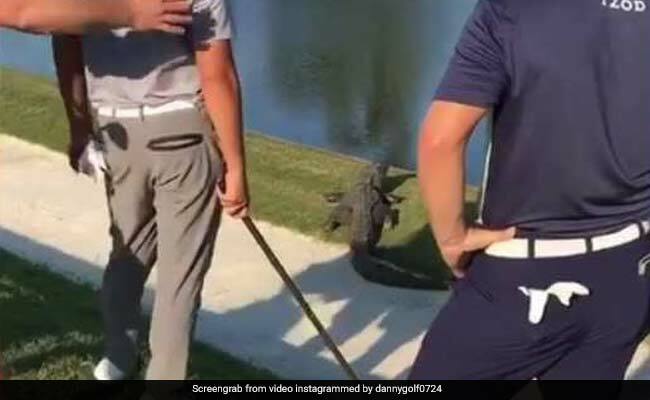 While practising for the Zurich Classic in New Orleans, USA, he hit his ball close to an alligator that was chilling on the course on the edge of a water body. A video posted by Mr Lee on his Instagram account shows him prodding the alligator with a rake in an attempt to move it. The gator, however, chose to remain at his sunny spot, paying no heed to the hapless humans trying to move it. The 27-year-old golfer joked that the encounter almost made him wet himself. "Well Cody Gribble I don't know how you did it... I have so much respect for you right now," he wrote, referring to the American golfer who recklessly approached an alligator last year. Few of us are Cody Gribble. Alligators are not an uncommon sight at golf courses. A Godzilla-sized alligator is often spotted strolling casually at the Buffalo Creek Golf Course in Florida.